Some companies will write a formal salary continuation plan for their employees. This states that, in the event that an employee becomes disabled and can no longer work, the company will continue paying his or her salary. When disability strikes the financial consequences can be devastating. A salary continuation plan will help the disabled stay on his or her feet and provide for his or her family. However, for the company, this plan can be dangerous; paying an employee who is no longer contributing is incredibly detrimental. Many companies involved in these kinds of contracts with their employees will indemnify this liability with Salary Continuation Disability Insurance. However, if an employee’s income exceeds the limits of the traditional markets this can still potentially place an unrealized liability on the books of the company. 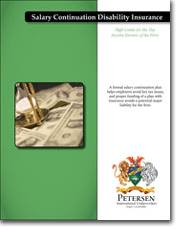 Petersen International Underwriters’ Salary Continuation Plan is designed to solve this problem. This insurance protects the disabled employee (insuring he or she will receive payment) as well as the company (protecting the business from taking a huge loss). Help your clients protect their employees, and themselves, from unnecessary financial distress with Salary Continuation Disability Insurance. Two foreign born doctors, who were in the United States on education visas while they studied in very specialized fields. They were hired by a hospital in Texas upon completion of their studies, and their visas were adjusted to work visas to reflect the change, but only for as long as they were employed by the Texas hospital. While they had some disability insurance in place through the hospital plan, they felt they needed more disability income insurance to cover their salaries at this new employment level. These gentlemen were also concerned about what would happen to their visa status and their disability payments should they become disabled. Yes, the visas would be canceled and the doctors would be sent back to their home countries. The question posed was would their disability insurance payments follow them should they have to leave the U.S. The answer is that through the hospital’s traditional carrier’s coverage the disability payments could not follow them outside the U.S.
Petersen was able to solve this very unique situation and put these doctors at ease regarding their income protection plan.